Identifiability is a property of a parametrization of a system. A parametrization is a map from a parameter set to a parametrized system. It maps parameter values to systems derived from the parametrized system by substituting the parameter values to the parameters. We say that a parametrization is globally identifiable if the parameter values can be uniquely determined from the data which are modeled by the parametrized system. It is structurally identifiable if this holds for almost all parameter values. Therefore verifying structural or global identifiability of a parametrization preceeds determination of numerical values of the parameters. In this paper, we derive necessary and sufficient conditions for the parametrizations of parametrized polynomial and parametrized rational systems to be structurally or globally identifiable. The results are applied to study the identifiability properties of the systems modeling certain biological phenomena. Nemcová, J. (2008). Structural identifiability of polynomial and rational systems. 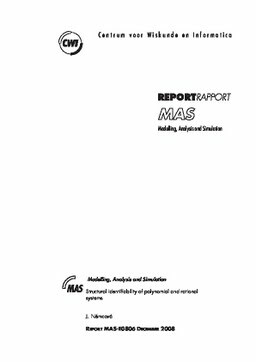 Modelling, Analysis and Simulation [MAS]. CWI.